We are more than halfway through our Chase the Sun Challenge, and now it’s easier than ever to earn a once in a lifetime trip, filled with exciting activities and exclusive business training. Whether you still need points to qualify or you’ve already qualified and want to earn a higher-level prize, we’ve got amazing news. Between Monday, 26th November (12.01am US EST) and Sunday, 2nd December (11.59pm US EST), we will DOUBLE your points* for all activity during this week! The more points you earn, the bigger your prize! 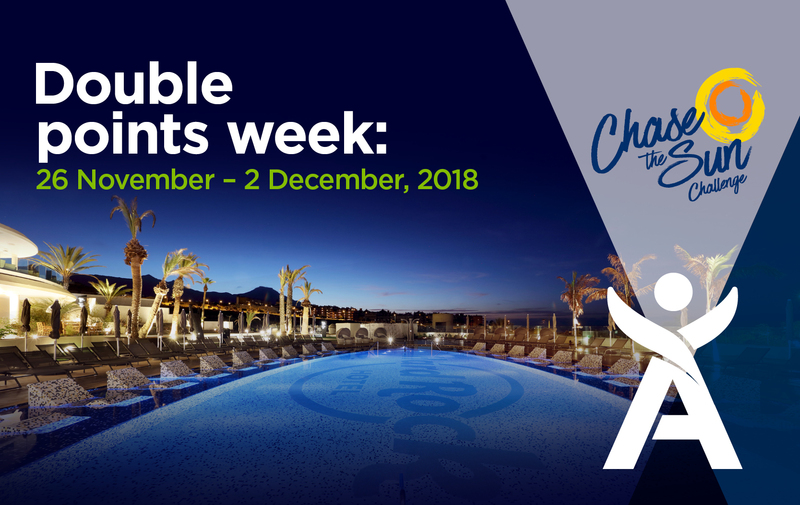 Spaces are unlimited for this incredible promotion so take advantage of DOUBLE points and start packing your bags for Tenerife! What are you waiting for? Step on the gas and win your place in the sun! For more details about this competition, check out the flyer. *Points will not show in your Back Office. Points will only be added at the end of the competition period. Open to Associates in the UK, Ireland, the Netherlands, Belgium and Spain only.